It's a yucky day -- unseasonably warm and rainy -- in New York City so I hope there's good weather wherever you are and that you're enjoying your birthday. If you see Larry Kaufman today, don't forget to wish him a happy birthday, too. In addition to a love of Torah and the URJ, a November 17th birthday was something else the two of you shared. There's lots to tell to bring you up to speed, so let's go. Last night I had dinner with Karen and Phil Ott, who were visiting in New York for the weekend. It was, as always, great to see them and, except for a few more gray hairs, they haven't changed at all! 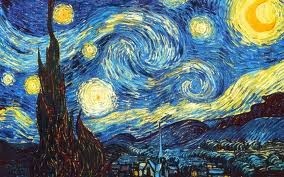 Over dinner, Karen told me that you'd hung a bunch of different post cards over my crib, including Van Gogh's Starry Night. She also told me that you often referred to me as Madame Nhu. Hmmm...based on what I read about her on Wikipedia, I can't quite figure that one out, but perhaps Daddy can shed some light on that particular nickname. I'll have a chance to do more awareness raising about BRCA mutations at two upcoming events. The first is a Biennial learning session, where I'll be a panelist together with Rabbi Marci Zimmerman from Temple Israel in Minneapolis and Dr. Susan Domchek, Executive Director, Basser Research Center for BRCA. In early February, I'm scheduled to speak at the Sisterhood Shabbat at Congregation Beth Or in Ambler, PA. Terry's planning to come with me, and she and I are already planning to make a weekend of it! As tough as the whole BRCA mutation journey has been, it is, at least, a harbinger -- something my friend Phyllis didn't have when leukemia struck her son, Sam. He just turned eight and, despite a bone marrow transplant from SuperMensch at the end of August, the family's huge community learned this past week that the cancer has returned and, as she wrote on Sam's blog, "There is no cure. There is no treatment." The six of them -- Phyllis and Michael, Sammy and his sibs -- will be off to Israel shortly, where they'll be packing a lifetime of memories into the time they've got left. We are so sad for all of them. There are no words and, as I noted on Facebook yesterday, "Jacob isn't the only one wrestling with God this week." I don't want to end on such a sad note so I'll tell you that Daddy and I are going to Detroit next weekend for Carolyn's bat mitzvah. Amy and Ian, unfortunately, can't go, not only because of Amy's crazy travel schedule, but also because she recently signed a book deal (!) and her writer is going to be in New York at the same time she would be at the bat mitzvah. One last thing: It's certainly not a book deal, but I recently took on an interesting freelance project with the Mellon Foundation, thanks to my connection to Scott from New Hampshire, and I need to go do some work on it. I'll write again soon.